Salmon is king. Beautiful, challenging, and delicious, all five species can be found in the Bay of Pillars during the prime fishing season: King (chinook), Coho (silver), Chum (dog), Pink (humpies), and Sockeye. Aside from its natural beauty, the Alaskan wilderness features some of the best salmon fishing in the world. 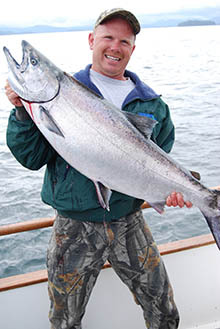 You have never seen salmon like this, so be prepared for the sports fishing trip of a lifetime. In the end, that is what Alaskan Experiences is for: to have you experience our state’s wilderness in ways you never forget (in part because your freezer is full of it in vacuum-packed bags for months afterward!). Be sure to add salmon fishing to your state-by-state bucket list. Though the King is the largest and most everyone's favorite, each of the five species has a unique flavor and characteristics that make them fun to catch and fun to cook. A thirty-pound king fills the better part of a fish box with vacuum-packed, salmon-pink fillets and steaks. Unless, of course, you land an Ivory King. White salmon meat is almost luminous, and thought by many to be the most succulent and flavorful -the best of the best. Fry it with some butter and rosemary, or grill with a glazing of brown sugar-- you can't go wrong. Each morning we'll boat out from the lodge on one of our two cabin cruisers with light, sporty rods to find silver. You’ll be expertly guided to the best combinations of geography, tide and time. We use top-notch G.Loomis rods with Shimano reels –strong, exceptionally light gear that puts the ‘’sport’’ in sport fishing. If you want to hoist a champion salmon, this is where you'll get it. For more information on Alaskan salmon fishing, contact Alaskan Experiences today.